Jim took on directing duties, enjoying the myriad bad puns and dog jokes from both in front of and behind the camera. While not part of the writing team, it was impossible for Jim’s long-time writing partner Jerry Juhl to stay away from so many delicious and dumb jokes, and he served as a co-producer on the shoot. After Dog City aired on May 5, 1989, Jim was gratified to hear that he had won the primetime Emmy award for outstanding directing in a variety or music program. 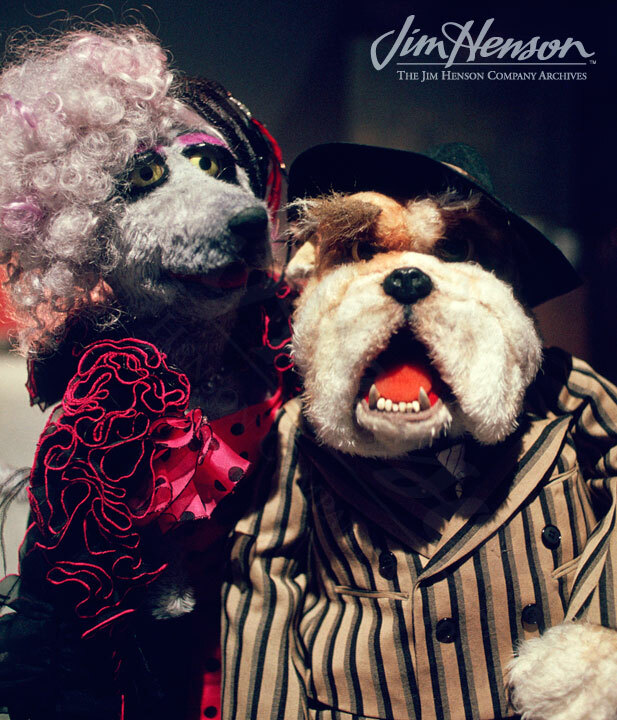 See the trailer for The Jim Henson Hour: Dog City. 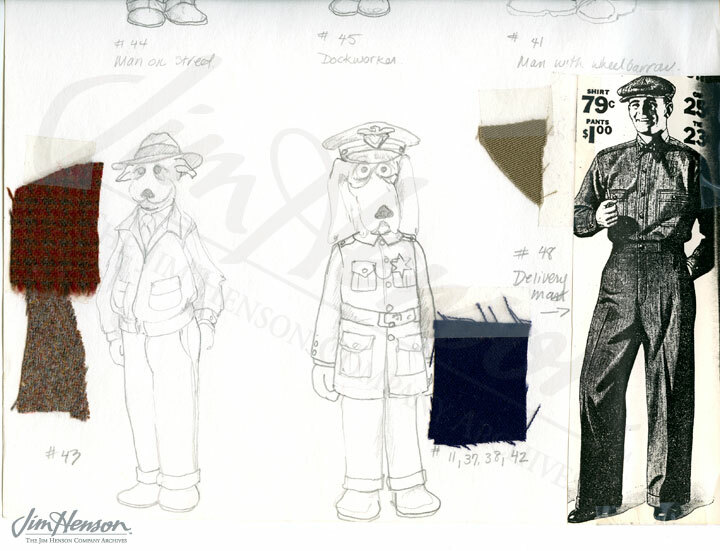 Learn about the various dogs that were part of the Henson household. 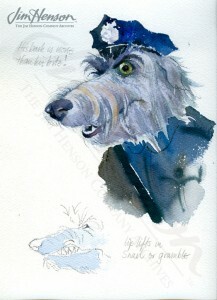 Bruce NcNally’s character design for Office O’Growler for Dog City. 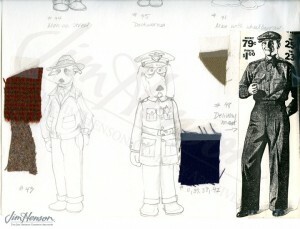 Polly Smith’s costume design and reference materials for Dog City. 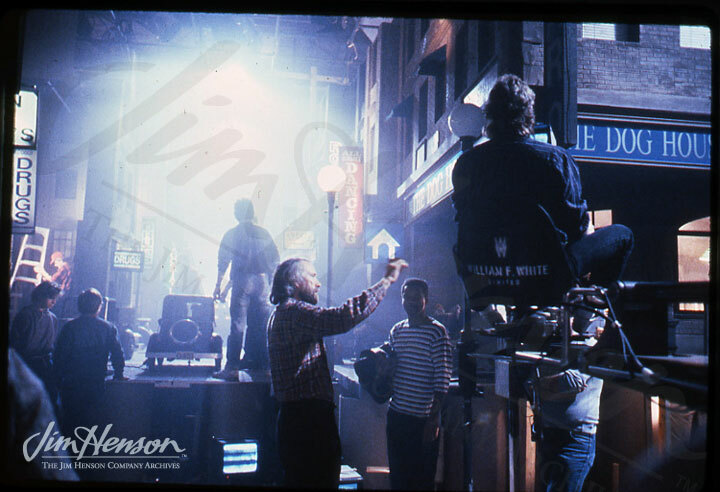 Jim directing on the set of Dog City, 1988. 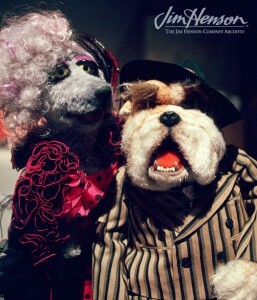 Bugsy and his moll Miss Belle from Dog City, 1988. This entry was posted in 11-November '88, 1988, Dog City and tagged Cynthia Friedlob, Foo Foo, Jerry Juhl, Jimmy Dean, John Semper, Mia Farrow, Miss Piggy, Rowlf, Rufus, The Jim Henson Hour, Tim Burns. Bookmark the permalink.